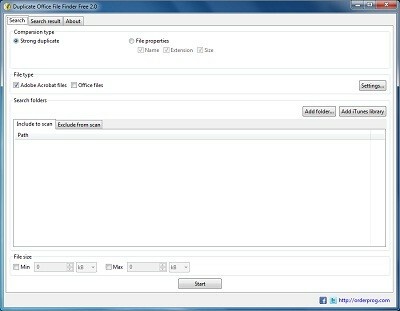 This program is designed to find and remove duplicate Office files. MS Office suite of applications is often used for creating any documents, spreadsheets, presentations, and so on. Often there is a need to create copies of the same files. This program will help get rid of the Office of duplicates in just a few minutes. The user can set the mask of duplicate files, for example, you can search only copies of Excel documents or duplicates only Word documents, and so on. In addition, this simple software allows you to find and remove duplicate PDF files. You can also search for files with the same name or the same extension or size. This program has a very simple and intuitive interface.